Ladies and gentlemen, meet the new poster child for my freshly-minted phrase: "the parts are greater than the whole", The Dark Knight Rises. Not all the parts - hence the Aristotle remix - just the ones that summon you to the edge of your seat, mouth agape in slack-jawed fashion, stunned by what's unfolding in front of your eyes. Those electrifying moments redeem Christopher Nolan's epic conclusion of his Batman trilogy - a rousing wrap to the man adorned with a black cape. Seconds after Warner Bros. logo hits the screen, Nolan delivers a bolt of lightning that's up there with the best of the James Bond openings as we feast our eyes on Bane (a vertically-challenged Tom Hardy), the muzzle-mouthed musclehead hellbent on becoming "Gotham's reckoning". If the Joker - as he put it in The Dark Knight - is like "a dog chasing cars", Bane is the steamroller obliterating both - a monster whose appetite for destruction annihilates GN'R's. With Bane's emergence, Gotham's eight-year period of peace - thanks to the sham known as the "Harvey Dent Act" - is history and it's time again to fire-up the now busted-up Bat-Signal and get the Howard Hughes-like recluse Bruce Wayne (Christian Bale, as if) back into his pointy-eared suit. A non-cartoonish Catwoman comes on board in the form of Anne Hathaway, swiping stuff from Wayne Manor and pushing along an unavailing subplot involving Wayne's financial ruin. It's Catwoman's crisis of conscience that makes the character a worthy addition - not to mention Hathaway looks smashing in spandex. Also new to the mix, a pair of actors who worked with Nolan on Inception: Joseph Gordon-Levitt, plays a cop who shares a common bond with the Caped Crusader and Marion Cotillard - debuting what appears to be cheek enhancements - shows up as a mega-moneyed investor in Wayne Enterprises who redacted. As for the film's numerous issues, at just shy of three hours in length, Nolan was too self-indulgent in the editing room; the middle of the movie meanders more than it ought to. 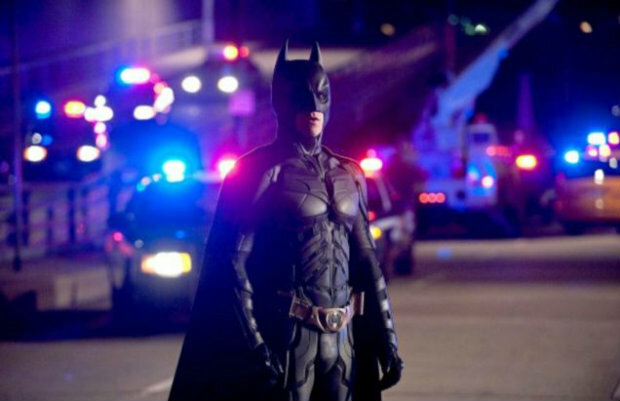 While The Dark Knight was nearly as long, it managed to have a more linear - streamlined - feel. Bane's voice is a major distraction; it's clearly been overdubbed throughout. The studio's fears that no one could make out what the heck Hardy was saying under his muzzle have produced a voice that's inorganic - it's layered on top of the film. What's more troubling, the intonation doesn't match the character's physicality. The voice that emanates from a roided-up terrorist should be more in line with Darth Vader than the dulcet tones of a Sean Connery sound-alike. And where exactly is Gotham City? Nolan casts aside Chicago - the backdrop for The Dark Knight Rises and Batman Begins - and sets up shop in New York City. If that weren't jarring enough, he fuses scenes shot in downtown Los Angeles with those from the Big Apple. It's disrespectful to the audience for a top-shelf director to make such a jump and assume no one would bother to notice. But after all the little annoyances, Nolan ultimately satiates his audience. While it's not as gritty as its superior predecessor The Dark Knight, or brimming with the inceptive wonder of Batman Begins, The Dark Knight Rises manages to mitigate its slew of shortcomings with a cinematically-administered, turbo-charged dose of adrenaline in the form of its sublimely-symphonic finale. Now someone smash-up the Bat-Signal for good.